This topic provides instructions for deploying Pivotal Cloud Foundry (PCF) Ops Manager to VMware vSphere. The instructions in this topic are based on vSphere 6.5 using the vSphere Client (HTML5) interface. For security purposes, VMware requires a dedicated instance of Ops Manager for use with Pivotal Container Service (PKS). Warning: If you are installing PKS on vSphere with NSX-T integration, follow the instructions in Deploying Ops Manager with NSX-T for PKS instead of performing the steps described in this topic. Log into vCenter using the vSphere Client (HTML5). Select the vSphere Datacenter where you are deploying Ops Manager. Right-click the vSphere Datacenter object. Name the Cluster. For example, Cluster1. Select Turn ON vSphere DRS to enable DRS. Set DRS Automation to Partially Automated or Full Automated. Select Turn ON vSphere HA to enable vSphere HA. Note: For highly available, production-ready environments, you must create more than one cluster. Create as many vSphere clusters as you need for the type of environment that you are building. For more information, see the Compute and HA Considerations and Scaling and Capacity Management sections of the vSphere Reference Architecture. Create a resource pool for the management components in your deployment. Resource pools are vSphere objects used to organize resources. Note: The management resource pool separates non-HA components such as Ops Manager and BOSH Director. For example, if you deploy Ops Manager for use with PKS, the PKS management plane includes Ops Manager, BOSH Director, the PKS control plane, and Harbor(optional). Right-click the vSphere cluster object that you created. Name the resource pool. For example, RP-MGMT. Review the default CPU and Memory settings and adjust if necessary. This is not common. Ops Manager for vSphere is provided as an OVA file. An OVA file is a template for a VM. To deploy Ops Manager on vSphere, you import the OVA file into your vSphere environment. 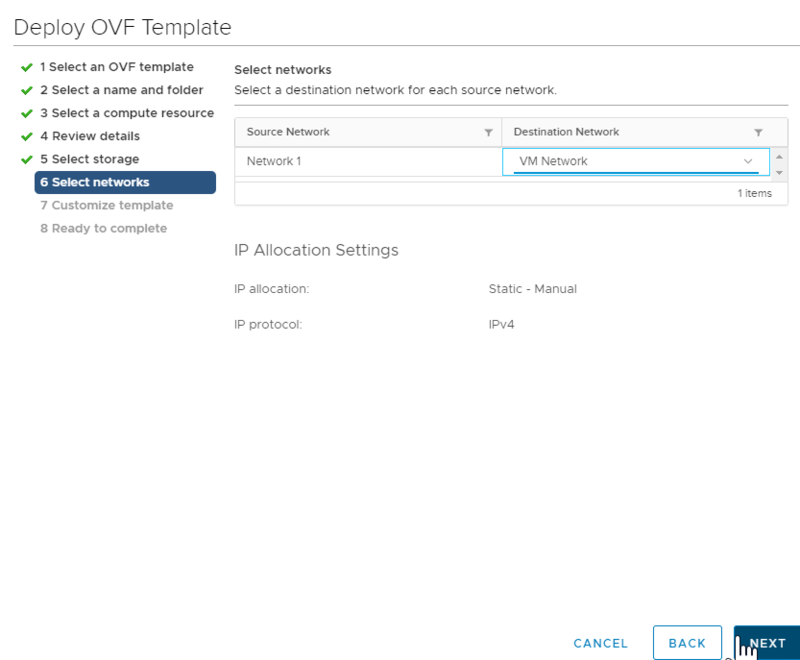 Download the Pivotal Cloud Foundry Operations Manager for vSphere OVA file from Pivotal Network. Use the Releases dropdown menu to select an Ops Manager release. 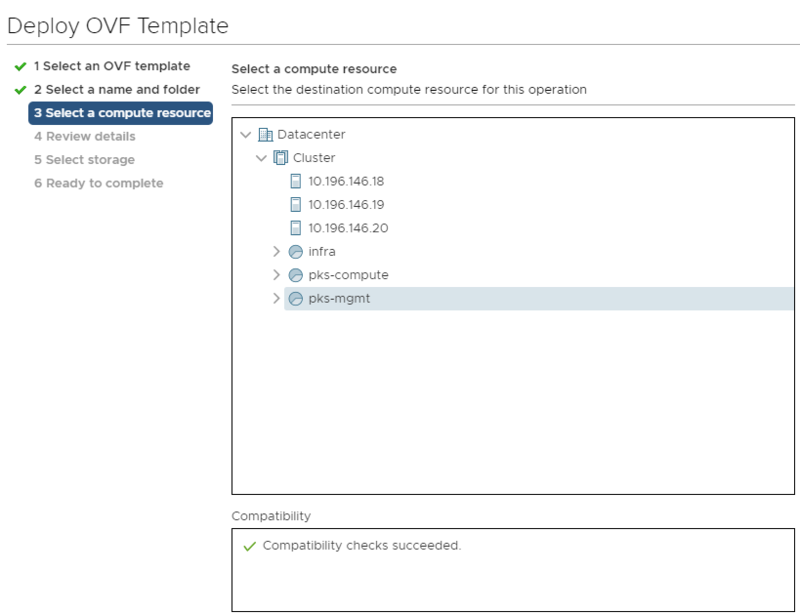 Right-click the management resource pool that you created and select Deploy OVF Template. 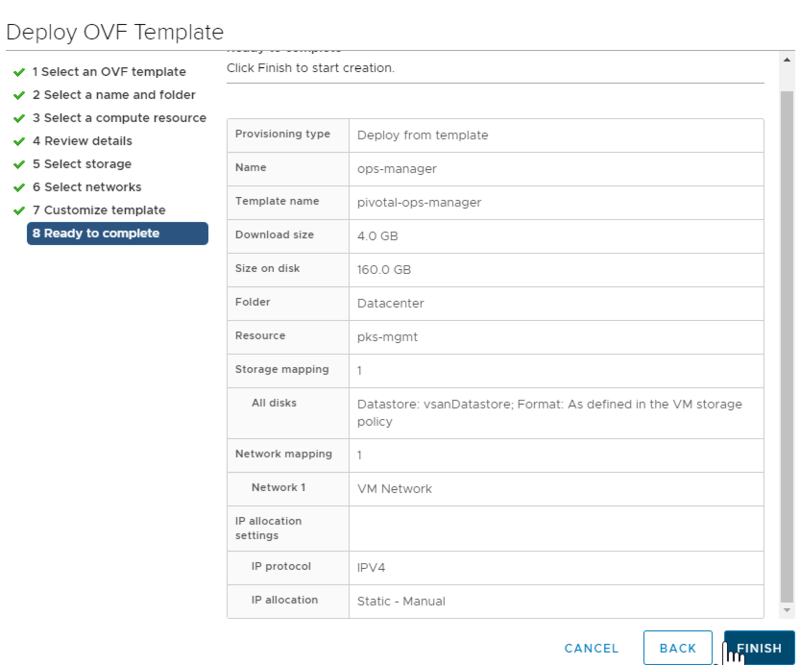 Alternatively, from the vCenter menu, select Actions > Deploy OVF Template. At the Select an OVF template screen, click Browse. Select the Ops Manager OVA file that you downloaded and click Open. Review template selection and click Next. Enter a name for the Ops Manager virtual machine, or use the default name. At the Select a compute resource screen, select the compute resource where the Ops Manager VM will run and click Next. Select the Resource Pool for the management components. Note: Hardware virtualization must be turned off if your vSphere host does not support VT-X/EPT. Refer to vSphere Requirements in PCF on vSphere Requirements for more information. At the Review Details screen, confirm the configuration up to this point and click Next. At the Select Storage screen, select the virtual disk format. If you use vSAN, select the vSAN datastore and apply the default storage policy. If you use a dedicated disk, select the appropriate disk format for your deployment needs. If in doubt, choose Thin Provision. For more information about disk formats, see vSphere Virtual Disk Types. Warning: Ops Manager requires a VM with at least 8 GB memory. At the Select Networks screen, select the standard VM Network, and click Next. At the Customize template screen, enter the following information, and click Next. IP Address: The IP address of the Ops Manager network interface. For example, 10.0.0.2. Netmask: The network mask for Ops Manager. For example, 255.255.255.0. Default Gateway: The default gateway for Ops Manager to use. For example, 10.0.0.1. DNS: One or more DNS servers for the Ops Manager VM to use. For example, 10.20.20.1. NTP Servers: The IP address of one or more NTP servers for Ops Manager. For example, 10.113.60.176. Admin Password: A default password for the ubuntu user. Public SSH Key: (Optional) Enter pre-existing public SSH key value to allow SSH access to the Ops Manager VM. Warning: You must specify a default password, an SSH key, or both. If you do not have either of these fields configured, Ops Manager will not start. Custom hostname: The hostname for the Ops Manager VM. For example, ops-manager. At the Ready to complete screen, review the configuration settings and click Finish. This action begins the OVA import and deployment process. Use the Recent Tasks panel at the bottom of the vCenter dashboard to check the progress of the OVA import and deployment. If the import or deployment is unsuccessful, check the configuration for errors. Fix any errors and restart the deployment process. Create a DNS entry for the IP address that you used for Ops Manager. You must use this fully qualified domain name when you log into Ops Manager. 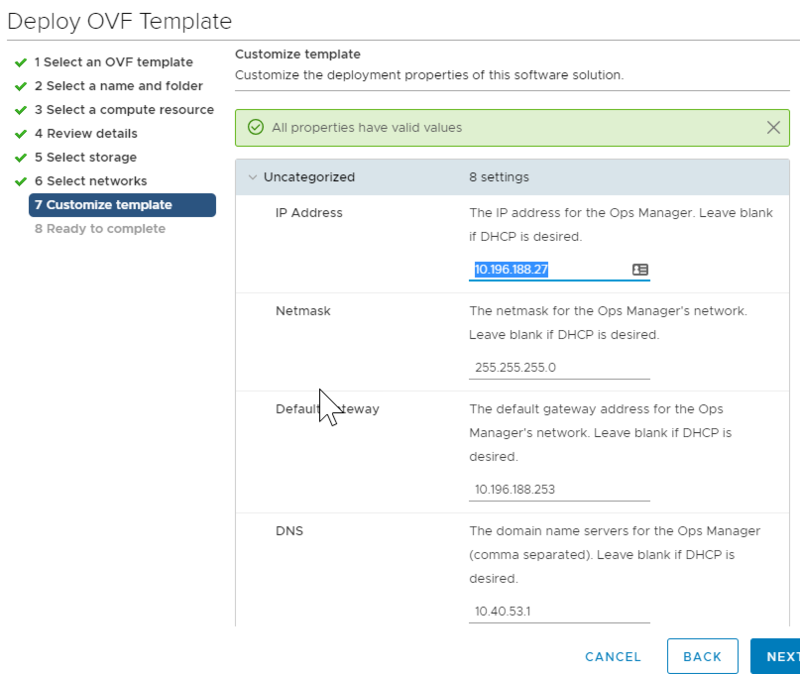 Note: Ops Manager security features require you to create a fully qualified domain name to access Ops Manager during the initial configuration. For more information, see PCF on vSphere Requirements. Select the Ops Manager VM and click Actions > Power > Power On. Once the VM boots, the Ops Manager web interface is available at the IP address that you specified. Note: It is normal to experience a brief delay before the interface is accessible while the web server and VM start. Navigate to the fully qualified domain of your Ops Manager in a web browser. After you complete this procedure, follow the instructions in Configuring BOSH Director on vSphere.